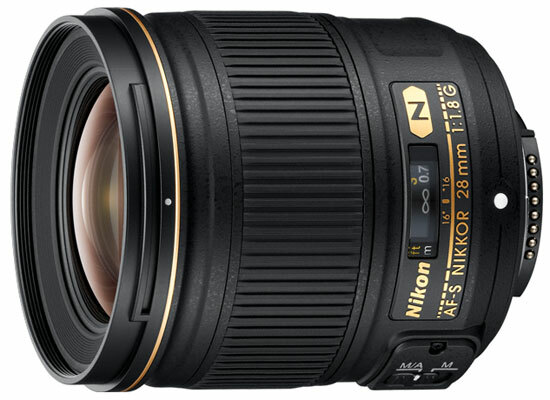 This is a prime lens manufactured by Nikon and the model was launched 2012. If you buy this lens it will come with a lens hood, whose model name is "HB-64". Text from Nikon: "FX-format prime lens offers fast f/1.8 aperture and delivers outstanding clarity and high contrast, low-light performance and depth-of-field control for beautiful stills and HD videos. Bring a dramatic wide-angle perspective to your still and HD video shooting. The AF-S NIKKOR 28mm f/1.8G´s fast maximum aperture lets you create in nearly any light—dusk to dawn, indoors or out—and offers outstanding depth-of-field control. Nikon´s exclusive Nano Crystal Coat nearly eliminates the ghosting and flare seen with some wide-angle lenses for improved clarity and contrast. Impressive on both FX- and DX-format cameras, the AF-S NIKKOR 28mm f/1.8G excels with landscapes, architecture, group shots, travel and more. Pair the AF-S NIKKOR 28mm f/1.8G with the AF-S NIKKOR 50mm f/1.8G and AF-S NIKKOR 85mm f/1.8G for a truly exceptional compact prime lens system. All three lenses offer the latest Nikon advancements and optical design characteristics, so you´ll get consistent performance at each focal length: wide-angle, standard and medium telephoto. It´s never been easier to expand your capabilities and creativity. Bayonet lens hood and lens pouch included."